Won't settle or sag like fiberglass, ensuring continual performance. Home insulation has come a long way from previous generations, stepping up the energy efficiency and comfort levels with each advance in technology. In days past sawdust was sometimes poured into walls to diminish heat loss. The next contender was vermiculite, which is composed of porous, lightweight pebbles that look and feel like kitty litter. Most homes today still use traditional fiberglass batts that are composed of spun glass fibers. None of these types of insulation compare to the versatility and effectiveness of our spray foam and its closed-cell polyurethane composition. With a spray foam installation from Blanket Insulation Services, you’ll be able to maximize your home’s comfort and minimize your energy expenses. We offer our services throughout Royal Oak, Farmington Hills, Ann Arbor, Livonia, Novi, Canton, Dearborn, Clinton Township, West Bloomfield, Ypsilanti, Farmington, Huntington Woods, Berkley, Clawson, Rochester Hills, South Lyon, Farmington Hills, and nearby in Michigan. Call or contact us to learn more or to schedule a Free Estimate! Spray foam insulation expands like magic as soon as you apply it. The foam sticks to everything, including skin and hair! Even though the foam insulation that Blanket applies is slightly different than canned foam, the benefits are the same. Spray foam is the only insulation that seals as well as insulates, so it often eliminates the need for separate air-sealing steps. Because of its expanding nature, spray foam excels at filling gaps, cracks and cavities, eliminating the energy-sapping "voids" that can occur when installing other types of insulation. This Royal Oak Michigan homeowner chose spray foam insulation for his home. This Royal Oak, Michigan homeowner wanted to insulate the exterior walls on their new construction addition to reduce drafts and decrease outside noise. We have used 2 inches of 2-part polyurethane spray foam which gives us the maximum air sealing and efficiency. This client made an excellent choice to utilize Spray Foam Insulation in their Shelby Township pole barn. R value. Polyurethane spray foam has some of the highest thermal value when compared to other commonly used insulation- R-6.2 or even higher depending on the formulation. Air sealing. Spray foam insulates and acts as an air barrier all in one application. Since it has impressive expansion capability, it fills and seals cracks and gaps, staying where applied due to its super-adhesive properties. Spray foam is frequently spot-applied and used for air sealing before an attic is filled with blown-in insulation. When used in greater amounts, it can actually eliminate the need for other types of insulation. Waterproof. Polyurethane spray foam stops water in its tracks, unlike fiberglass and cellulose insulation. The closed-cell structure of the foam prevents water from permeating the material in any way. Foolproof. An area of missing insulation, even just 5% of an insulated area, can diminish the overall performance of the insulation by as much as 50%! 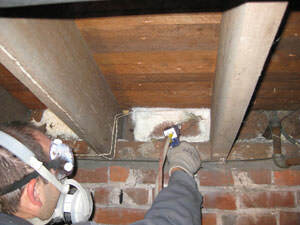 With the difficulty involved in installing fiberglass insulation, voids can easily be a possibility. This is where spray foam shines! It’s expansive, highly adhesive nature eliminates the possibility of voids, and since it cures firmly, it won’t shift or settle like cellulose or fiberglass. 2-part foam: For larger projects such as a basement or attic, contractors will typically select 2-part polyurethane foam that comes in two separate containers. The resin and catalyst are mixed at the nozzle, creating the foaming chemical reaction that causes spray foam to expand. Difficulty: Getting the hang of applying spray foam, particularly two-part foams, takes a significant amount of experience. Since they have different rates of expansion and other unique characteristics, they are problematic for an inexperienced individual to get the most out of the material. Highly expansive foam can potentially damage a window jamb or door, but with our skilled specialists we can prevent something like this from occurring. Spray foam installation can be messy and wasteful, but our fully trained experts will get the job done well the first time! Temperature sensitivity: Cold temperatures will affect the chemistry of the foaming action. It’s very important to keep spray foam cans or the two-part foam canisters in a small temperature range to ensure proper application. Check out our comparison between spray foam and rigid foam insulation. We can also help you choose the right spray foam insulation. Blanket Insulation Services is your local resource for all spray foam insulation services including crawl space, attic, and basement! Call or contact us today to learn more or to schedule a free estimate. We offer our services throughout the Greater Detroit area, including Detroit, Plymouth, Warren, Sterling Heights, Ann Arbor, Farmington, West Bloomfield, Dearborn, Novi, Ypsilanti, Clinton Township, Canton, Livonia, Huntington Woods, Berkley, Clawson, Rochester Hills, South Lyon, Farmington Hills, and the surrounding cities and towns in Michigan.